I've been wanting to do some budget-type posts over here for a bit now. It's just something that has been on our minds lately, while we think about our 5-year plan. (That is a post for another day.) In my last Fun Finds Friday post I linked to this article about people who were given $100 to spend at the grocery store, and how they each spent it. The stark contrasts in how people spent their money fascinates me! The college student who mostly bought pre-packaged food, the bartender who spent more than half the money on a bottle of wine, the couple who bought mostly meat and produce... it's a great peek into other people's lives! Yesterday evening I made a grocery run and when I got home I realized everything had totaled close to $100. (Okay, $125, minus a $6 bag of cat litter that isn't pictured... $119 is close enough, right? I didn't feel like doing the math to omit things.) I bought all the household stuff at Target, and all the actual food items at Acme. Granted, this isn't really what a usual grocery store run looks like for us because we prefer to go to Trader Joe's and our local farmer's market. But as you can see, we really needed to re-stock on household items, so a trip to Target was in order. Thankfully, we don't need to buy all those things every week. A weekly grocery run for us usually costs closer to $50/$60, and that's just for food. Next time I go to Trader Joe's I should snap another photo of all the goods so that you can see the difference! It seems like we always run out of toilet paper, paper towels, soap, detergent, etc... at the the same time! This always makes for one costly shopping trip, but on the upside I suppose it means I only ever need to make one trip for everything. Does this happen to you too? 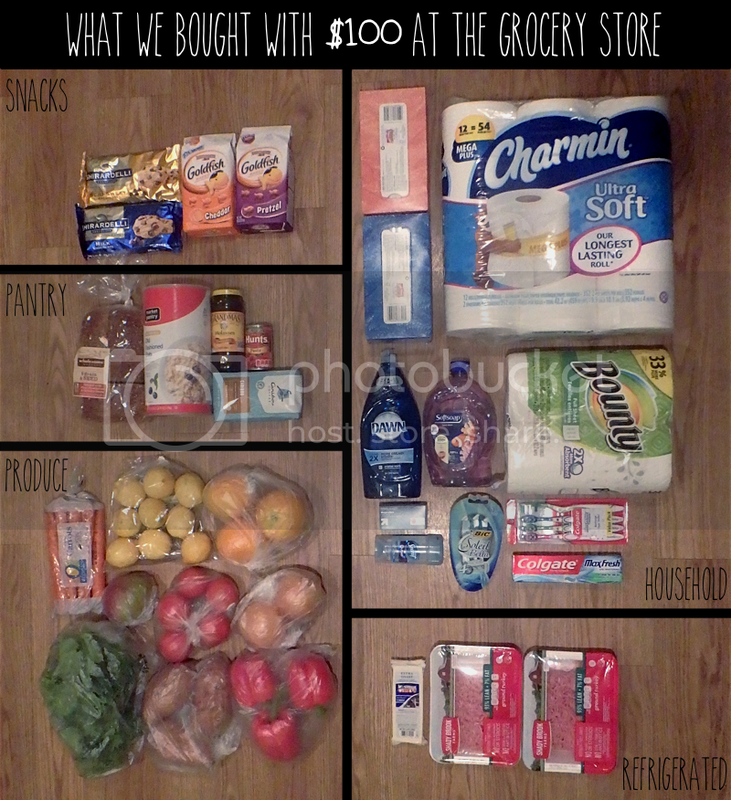 How would you spend $100 at the grocery store? Thankfully it's just the two of us... I can't imagine having to shop for a family!